Celebrities have joined the call for a total ban on fox hunting in Scotland. 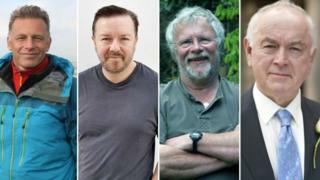 Comedian Ricky Gervais, television presenter and naturalist Chris Packham, conservationist Bill Oddie and actor Peter Egan all want to see exemptions on the practice outlawed. Fox hunting is banned in Scotland, but dogs are still allowed to flush out foxes for pest control. Three charities have organised a march next month in Edinburgh to highlight the issue. The bid is led by the League Against Cruel Sports, OneKind and the International Fund for Animal Welfare (IFAW). The Protection of Wild Mammals (Scotland) Act in 2002, effectively banned fox hunting with dogs, with an exemption for using them to flush out foxes for pest control or protecting livestock or ground-nesting birds. Mounted hunts in Scotland have since offered farmers, landowners and estate managers a pest control service, but a review by Lord Bonomy found there were "grounds to suspect" fox hunting takes place illegally and he recommended having independent monitors to police hunts. The charities believe the Act is "insufficient" and have been campaigning for it to be improved to close "loopholes" that allow for traditional hunting. The League Against Cruel Sports has also released video footage it claims shows Scottish hunts "causing panic" among flocks of sheep. Mr Gervais said: "It is utterly sickening that the primitive, horrific pastime of chasing foxes with packs of hounds is still happening routinely in this country with little or no means of bringing to justice those who inflict such cruelty on wildlife. "The Scottish government has an opportunity to make this appalling 'sport' go away so it's high time it stopped dragging its feet and got on with improving the law to ban fox hunting once and for all." Mr Packham added: "It is quite staggering that in this day and age we live in a country where people go out with the intention of terrorising wild animals by chasing them to the point of exhaustion and brutally killing them. "Sadly in Scotland the law has proven not to be sufficient to stop this horrific behaviour. "I wholeheartedly support the League Against Cruel Sports and OneKind in their campaign calling on the Scottish Government to strengthen the law to make sure fox hunting is really banned in Scotland. "Fox hunting has no place in modern society and now is the time to put it firmly where it belongs - in the past." The Scottish Government has consulted on Lord Bonomy's recommendations with analysis currently under way on the responses.